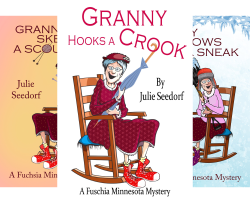 It’s A Fuchsia, MN Cozy Mystery Day! I am excited. Finally, after over a year I will have a new book out. In fact, it has been almost two years since you have heard from Granny aka Hermiony Vidalia Criony Fiddlestadt Crickett. I wanted to share with you the new cover for Granny Bricks A Bandit. My publishing company tells me it is close. Here is the scenario: Granny and her cohorts are at it again! When Granny and her neighbor Mavis, go water-skiing and discover a dead body, Granny’s sleuthing instincts take over! She is determined to identify the corpse and find the killer. But wait! No sooner are Granny and her cohorts on the murderer’s trail, then Mavis’ husband George suddenly disappears! Could he be the killer’s next victim? Or could he be the killer? When the gals take a side trip to the Mall of America, they find a man fell to his death on a climbing wall––and Mavis is certain she spots George nearby! What does it all mean? Will Granny get to the bottom of it, with the help of her entourage of buddies and pets? In case you haven’t read the others in the Fuchsia Series for one more week the rest of the series will be on sale on Kindle for $.99. My new newsletter will be out the first part of March with the details and also I will highlight a little of what I have been doing during the snowy exile we have had in Minnesota. Be sure to get on the mailing list. I am also in the process of writing reviews for a couple of the books I have read so watch this site for those reviews. Until we meet again in Granny Bricks A Bandit…. I became aware of Author, Bart Gilbertson and his books a few years ago when he joined the publishing company that publishes my Fuchsia, Minnesota Cozy Mystery Series. His first book was Deathbed and Breakfast. I loved the book and he quickly became a friend. Bart took a few years off for some personal business and now he is back. Not only did he author the first chapter in the new group mystery, Wheel of Death by Cozy Cat Press, but his new short story will get your attention. Shout From A Rooftop is based on a true story and takes place in Corpus Christi, Texas. Who knew a girl’s slumber party could turn into a mystery that will keep the community on edge and a reader turning the pages in anticipation of the next words or twist and turn in the story? Bart’s writing has only gotten better. You will want to read this short story and his book, Deathbed and Breakfast. I look forward to the next book in his journey as an author. Five stars and that is not because he is my friend but because he has earned it. In 1961, the only thing that might save your life is a Shout From A Rooftop. Late one night in Corpus Christi, Texas, a teenage girl pajama party is crashed by an uninvited guest – a man with white hair and pink eyes. What began as a night of fun, games and music turned into a nightmare that none of them would ever be able to forget. You won’t believe what your eyes are reading as a crazed maniac pursues them to all ends … even if it means going all the way to the top of the roof. Taken from Bart’s Author page on Amazon. WELCOME and thank you for stopping by my Author Page. So, who am I? Well, I guess I’m just your average person pursuing his dream. I love a good fiction novel. A mystery, epic fantasy, adventure, or comedy…I love it all. With my own writing, I want to put a good quality story on the shelf…something that I would like to read. Something I think that you’d like to read. Things I like (but am not restricted to): Positive, upbeat people. Smiles. A hot cup of coffee. Flannel shirts. Sports (mainly football and basketball). Music … love music. If you like my stories, please remember to leave a review. I bought this book when I saw it advertised on one of the books sites I belong to. The cover caught my eye along with the title. I read the synopsis and thought perhaps it might be a good read but I was wrong. It was a great read! I loved…loved…loved this book! Perhaps the reason I like it so much was because I am in the same season of life as the women in this book. Sina, Ateca, Ingrid, Maya, Lisbeth and Kat have all had different experiences. Sina, Ingrid, Maya, LIsbeth and Kat were friends in their youth. They drifted apart over the years but Kat brings them all together on a tropical island to perhaps live out their days or discover new things about themselves. I could resonate with many of their feelings. I felt the yearning for a simplicity in their later years. And the regrets. We all have regrets. We all have ideas in our mind of what was only to find out our perceptions in our youth might have been skewed. Journey with these women. You will laugh, cry and be invested in their lives by the end of the book. This was an unexpected treat of a read. I highly recommend it. I would give it more than five stars but reading is a journey each person experiences in different ways. Anne Ostby is a Norwegian author, b. 1958. She has eleven published books for adults, YA, and children. Her latest novel, Pieces of Happiness, is sold to eleven different countries, and will be out in English in June (Doubleday Books). Anne Ostby has spent the last 27 years as a global nomad, living in nine different countries. Her novels frequently discuss questions of identity in an international setting, and depict women’s lives in various cultures. She currently lives in East Timor. It is no secret that I like Diane Weiner’s Sugarbury Falls series. It is my favorite of her two series. I have been remiss in posting this review. I finished the book as soon as it came out because of course, I wanted to be one of the first to review and then life got in the way. I want to apologize for this being so late. I have grown to love the main characters in this series, Emily, Henry, and Maddy. They are likable and I think the adoption story resonates with many. Not only is this mystery set in the idyllic cozy town but it weaves a tale of a family secret buried which endangers the lives of the entire Fox family. If I can’t connect with the characters in a mystery and I don’t begin to care about them as any series progresses then I lose interest. A reader will not lose interest in this series. If you haven’t read the first two books, A Deadly Course and Murder of Course then I urge you to buy the set. You won’t be disappointed. I have Clearing The Course five stars. The Fox family returns from Scotland to find Sugarbury Falls mourning the mysterious death of a young college student. When teenager Maddy’s friend Robby is accused of the murder, Emily and Henry try to clear his name. After all, they’d do anything to help their newly adopted daughter. The more they investigate, however, the less certain they are of Robby’s innocence. With a detour leading to a long-buried family secret, the path of the investigation is convoluted and dangerous. Can they clear the course and arrive at the truth, or is it too late? Reviews are important so if you like this book leave a review on Amazon or wherever you bought the book. One of the blessings of writing this column and being an author is meeting my readers. This past weekend I was at the Deep Valley Book Festival in Mankato. I met some fabulous authors and interesting people. This coming weekend the big book event is in Albert Lea. Sweet Reads Book Store in Austin is sponsoring a book event with 10 southern Minnesota authors at the Interchange Coffee House in Albert Lea on Saturday, and I am one of them. Small, independent bookstores are making their comeback in our society today, and Sweet Reads is very supportive of local authors. Besides myself, Sherrie Hansen, Sean Williams, Benet Stoen, Judi Bergen, Chris Norbury, Margaret Smolik, Jeffo Oilman, Lydia Emma Niebuhr, and Karl Shaper will be in attendance. Not only will we be displaying and selling our books, but we will also be on the authoring stage for 20 minutes apiece explaining our various genres and talking about our writing. I get to start off the morning at 10 a.m. and it will be cozy, meaning cozy mysteries. Do you know what they are? I didn’t until I wrote one and was accepted by a cozy publisher, Cozy Cat Press. I was amazed to find out it is a popular category in the fiction world. Maybe you have heard of us, or maybe these names are new to you. My problem with attending a book event is that I want to buy all of the books. Did I mention I tingle when I am in a bookstore or library? We all know about the New York Times best-selling authors and those from large publishing companies whose names and books are advertised in every magazine and online by their publishing companies. We always tend to gravitate toward these books because we feel they must be the best because we see them front and center constantly in the media. I encourage you to read authors you have never heard of. I find by taking a chance on an unknown author, I read some of the best literature and novels. The difference between these authors not being recognized is because small publishing companies do not have the capital to advertise, and independent authors also do not have the means of promoting their books because of lack of ways for exposure. It’s work to get your name and book out there. Big stores like Barnes & Noble do not always carry small publishers or independent authors’ books because of return policies. Small publishing houses cannot meet their requirements or they would be out of business. Always ask if you can’t find the book, because they can be ordered from the store on an individual basis. There are many books by unknown authors that are not on the New York Times best-selling list or have not won any awards but are award-winning reads in readers’ minds. What many do not know is the costs involved for a book to be considered for an award — again, small publishing houses and authors do not have the money to enter their book for the prestigious awards. The same can be said for reviews by esteemed reviewers such as Kirkus reviews. It can cost an author $425 for them to review your book. It may pay off in the end, but many independent authors and small publishing houses, again, can’t afford the cost. What I am saying is to not write off an author or a book because you don’t see that award sticker or prestigious review on the book. Instead, read online reviews of the book by readers or talk to the author or take a chance on one book — you may want to buy the next. Anyone can publish a book these days, and there are those clinkers out there which are badly edited and loosely put together, but I always feel they do not have the support in a good editor — because editors, too, are expensive. But these authors had a dream and their dream has been realized — to see their book in print. I will never be in the category of William Kent Krueger or Allan Eskens. There is a difference between a great author and a good author. I will put myself realistically in the good author category because some people do like my books. I will never win any awards, as I don’t try for any, but I have been in the top 100 Amazon Cozies with my books and I have been No. 1 occasionally when my new books come out. That is enough for me. The best reward for my writing is to meet my readers, get to know them and see what they enjoy reading. Their lives count and so do their stories. Every person has a story in their lives. It may yet be written. Come down on Saturday to Sweet Reads and meet the authors, share your stories and let us get to know who and how we influence your lives. The event is from 10 a.m. to 2 p.m. at the Interchange. Visit for a short time or stay for the day. Passing along this sale. One of my books is here too. There are so many good authors offering their books on sale for a limited time. Digital is the Name, More Markets is My Game!